Who is this Very Important Person and what have they to do with Marquetry? 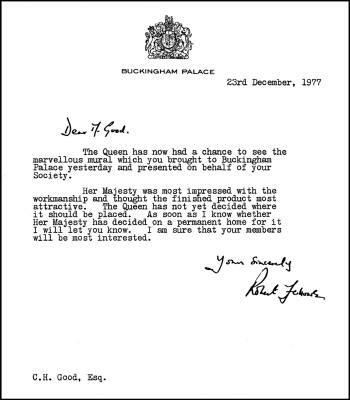 Yes that's right you've guessed it, the very important person is no other than Her Majesty the Queen. 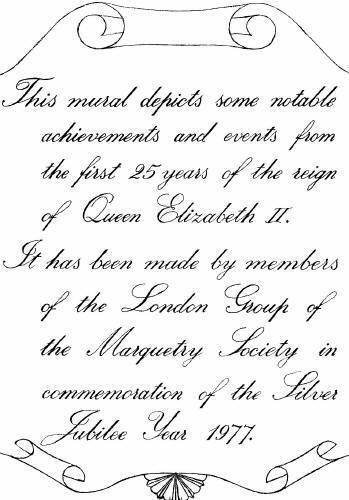 The London Group made this very large mural for the Queen's Silver Jubilee in 1977 and as the reprint shown below of the letter sent to Charlie Good from Buckingham Palace confirms, Her Majesty was most impressed with the marquetry piece. 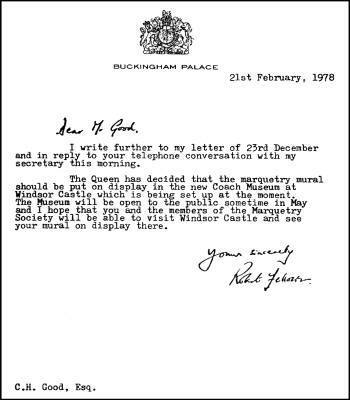 You will be pleased to know that the Queen did indeed find a place to hang the picture and it hangs, I believe to this day, in Her Majesty's Coach House. That extremely well respected marquetarian, the aforementioned Charlie Good acted as the spokesman and representative of the London Group in all the dealings at Buckingham Palace concerning this highly impressive work. The picture actually made it's debut at an exhibition in the House of Commons at the Houses of Parliament London under the auspices of Bill Lincoln (the then owner of Art Veneers) and was unanimously given the 'thumbs up' by the members of Government of the day. This picture proved to be a real feather in the cap for the members of the London Group and Alf Murtell in particular who participated in the picture and who provided the notes for this article, thanks Alf. 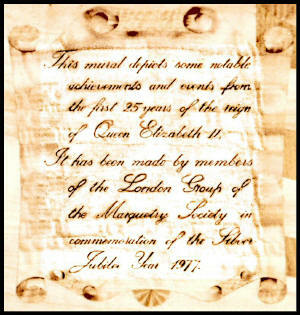 This picture below is a reprint of the scroll seen on the right hand side of the silver jubilee mural just below the Windsor Castle picture. As it is difficult to read the wording in the photo, presumably due to the lighting conditions at the time and the reflective nature of the grain pattern of the selected veneer, I have re-sampled that section and enhanced it in Photo Shop for you, I think it's worth it, don't you? We have also added a more legible version of the wording below the scroll for your convenience.